Seven Springs Mountain Resort will be hosting the Chateau Ste. 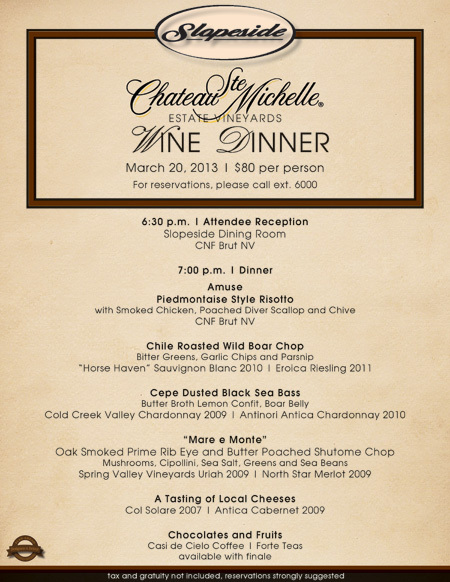 Michelle Vineyards Wine Dinner in their Slopeside restaurant at 6:30 p.m. Wednesday March 20th, 2013. This dinner will feature a wine pairing for each course from the Chateau Ste. Michelle winery. I have posted the menu for your convenience. Reservations can be made by calling 800-452-2223 ext.6000. Seven Springs Mountain Resort is at 777 Waterwheel Dr. Seven Springs, Pa 15622. This entry was posted in Wine news and tagged Chateau Ste. Michelle, Drink, Finger Lakes, food, New York, Recreation, Ripepi Winery and Vineyards, Seven Springs Mountain Resort, United States, Washington wine, wine, wine dinner. Bookmark the permalink.